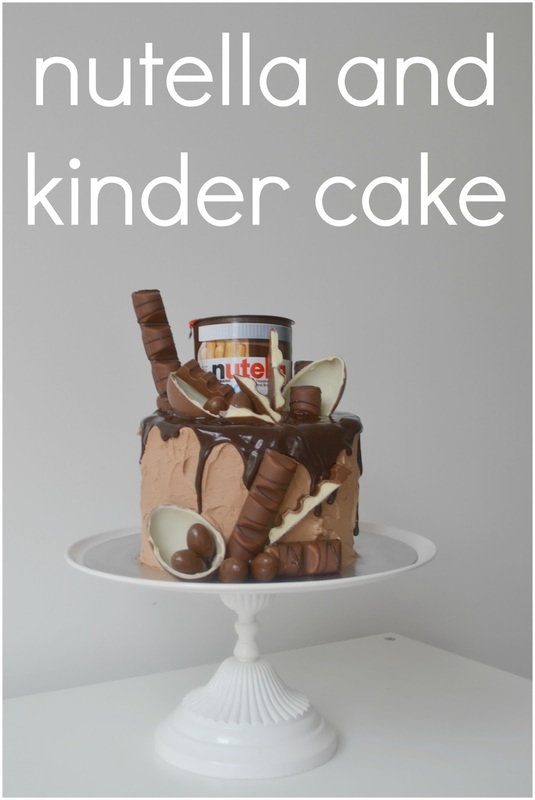 Procrastibake: Nutella and Kinder Cake... For Real. I knew this cake was coming up. I knew this would be ready for after Easter because I knew that like every year, there would be bits and pieces of Easter eggs everywhere in this house. And I would need something to do with them. A buddy of mine was all, hey I need cake and I was like sure thing, I've got a cake for you. This is what she got. She didn't complain and mentioned that she was browsing for tombstones on Amazon. That's a good sign right? It's pure, unfiltered death by chocolate. It's two layers of a moist chocolate cake, filled with a hazelnut buttercream, topped with a chocolate ganache, dressed in Kinder and Nutella. 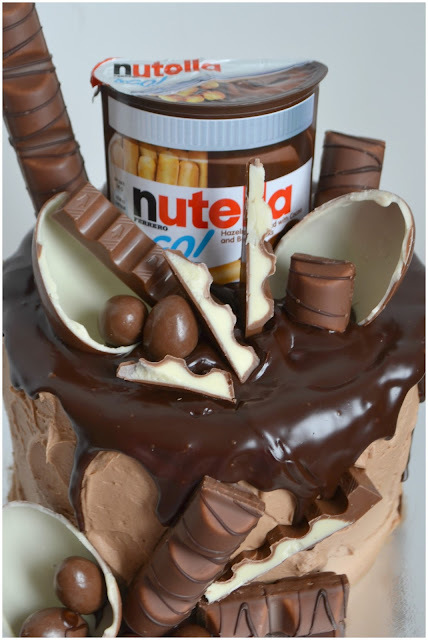 It's everything a left over Easter Egg chocolate cake should be. And what's more important, is that it uses up all the left over chocolate in the house... which I have been informed is a very elusive ingredient. Like left over wine... folks find it hard to come across these things! Line two 8 inch round cake tins with parchment, or spray with some cake release spray. *** YOU MAY NOT NEED THIS...BUT If the buttercream is very thick, add a tablespoon of cream or milk in until the desired texture has been reached. Mix it until light and fluffy. The faster and longer you mix this, the lighter and fluffier it will be. ***Alternatively you could use some of the chocolate ganache below to make your chocolate buttercream... 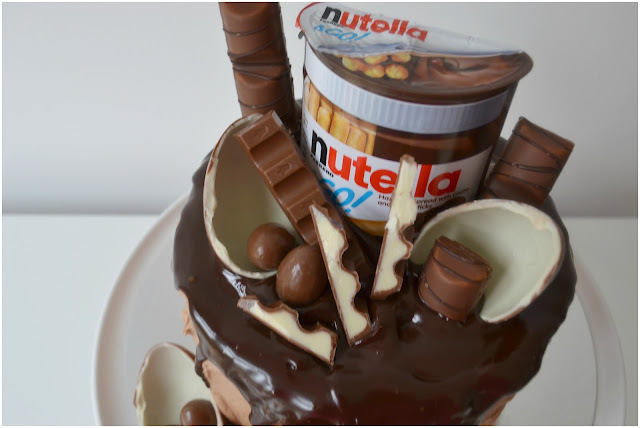 It just won't taste like nutella. You get me. It'll taste like chocolate. Put the chocolate into a heat resistant bowl. Heat the cream in a saucepan over a medium heat, stirring occasionally. When the cream begins to simmer, quickly remove from the heat and pour it over the chocolate. Swirl the bowl to ensure all the chocolate is coated in the hot cream. Cover the bowl to trap the heat and let it rest for 5 minutes. Remove the lid and slowly whisk the mixture until you have a smooth glossy ganache. Leave to cool before using as a glaze on the cake. 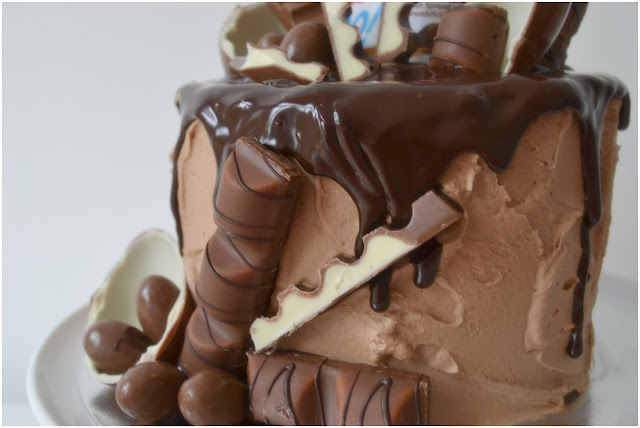 To finish it's really very simple... you just layer up the cake with the frosting, slap it on rough on the outside, smudge over the ganache and decorate with all the Kinder bits and bobs you like! People will LOVE. YOU. FOR. IT. But it's up to you here.. decorate how you like it! This is how mine turned out and I think it looks rather good. Biased and all that I am. Let me know if you give it a go.. I'd only love to know how you got on. Plus I love to see others creativity and hard work..
That looks so good... No left over chocolate here. I seem to have eaten it all! usually the case in this house also.. this time though, I was ready for collection! 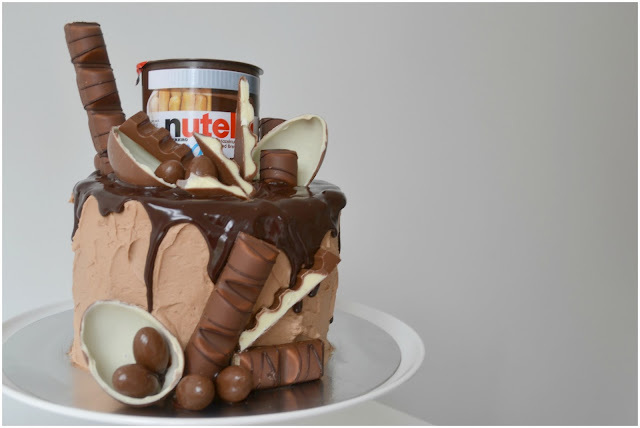 Woah now that is a cake and a half! What a lucky friend.